Chewbacca, the fictional ‘Star Wars’ character, has given his name to a new species of flightless beetle, discovered in New Britain, Papua New Guinea. 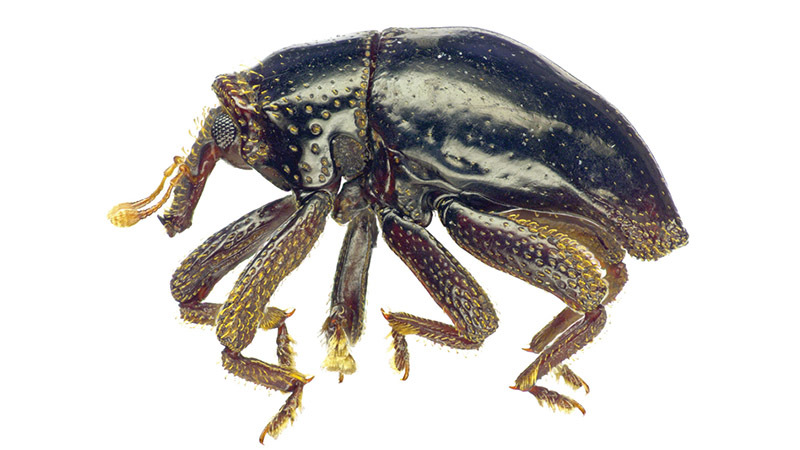 Although Trigonopterus chewbacca was only one of the four black new weevil beetles found during the expedition, it stood out with its curious scales, which made the authors think of Han Solo’s loyal companion. Scientists Dr Matthew H. Van Dam, SNSB-Zoological State Collection, Germany, Raymond Laufa, The University of Papua New Guinea and Dr Alexander Riedel, Natural History Museum Karlsruhe have their paper, where they describe the new species, published in the open access journal ZooKeys. Failing to understand how was it possible that the hyperdiverse beetle genus Trigonopterus has never been spotted in New Britain, two of the researchers travelled to the island to double-check the foliage and leaf litter. Interestingly, the genus thrives best in Melanesia, the Oceania subregion, where Papua New Guinea is located, yet there had been only a single Trigonopterus species known from Bismarck Archipelago prior to the present study. Eventually, having spent ten days sifting leaf litter and beating foliage, the authors discovered eighteen individuals in primary forests growing on limestone karst, and later assigned them to four separate species. However, these few findings are still striking, given the abundance of the beetles in similar localities in the New-Guinean mainland. Unlike its sci-fi namesake, the Chewbacca beetle cannot rely on its measurements to scare other possibly malevolent species off. It only measures between 2.78 and 3.13 mm. Dissimilar again, is its body, which is black and rhomboid-shaped, while its legs and antenna appear rusty. What likens the beetle to “Chewie”, however, is its distinctively dense scales, covering its head and legs. In conclusion, the authors note that the beetle genus must have colonised New Britain at least four times in the past. “Given the size, mountainous topography and tropical vegetation of New Britain, it is likely that Trigonopterus has undergone some local speciation on the island, but this possibility requires further investigation,” they say.